The District Transport Office, Hailakandi district of Assam is making much headway in Revenue mobilisation for the current financial year 2017-18. The tax has been generated also by way of fines against vehicles plying without proper documents. “Around 731 cases were booked for violating different provisions of Motor Vehicle Act and Rules leading to tax realization of more than Rs.10 lakh,” he said. 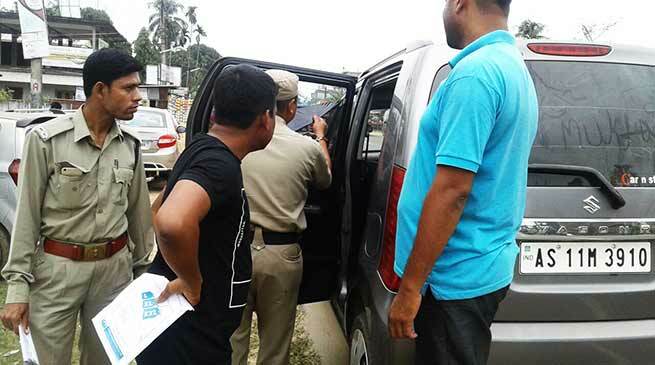 Kalita with help from the civil and police administrations seized 30 excavators (JCBs) and 20 tippers having registration outside the state for operating unauthorised in Hailakandi district and realised taxes to the tune of around Rs.20 lakh. “These JCBs and tippers were engaged at work in different parts of the district. With help and support of the civil and police administrations, we seized the vehicles and realised taxes by way of penalties,” he added. Insofar as road mishaps are concerned, Hailakandi district fares better than its neighbouring Karimganj and Cachar districts, thanks to the slew of road safety measures initiated by DTO Kalita and his team. Road safety education programmes coupled with awareness campaigns involving school and college students are being organised from time to time. That is not all. Refresher training on road safety for drivers of Public Service Vehicles (PSVs) and goods carrier vehicles are being conducted periodically. “A host of road safety measures initiated have helped in minimising the number of road accidents in the entire district,” said Kalita, adding that leaflets and pamphlets with do’s and don’ts are being distributed among the people, especially the youth to ‘sensitise them about road safety rules and raise the level of awareness’. Those who violate motor vehicle rules with impunity face stringent action leading to suspension of licences. 70 licences of different modes of vehicles have been impounded for violation of motor vehicle rules during the past 10-11 months. Even penalties have been imposed on vehicles belching out smoke above the prescribed emission level. “It is mandatory for all vehicles whether it be private or government or commercial to obtain pollution under control certificate after completion of one year from the date of initial registration,” said Kalita. The District Transport Office has initiated tough action against vehicles with tinted glasses. “Barring the Z and Z+ category persons and that, too, after being cleared by the committee constituted by the Government, no black films can be pasted on the glasses of any vehicle as per the directive of Hon’ble Supreme Court,” said Kalita. Leaflets urging the owners and drivers to pay taxes on time and to get their licence, permit, fitness certificate renewed to avoid penalty and other complicacies are being distributed from time to time. “Vehicle owners must pay taxes on time and keep their papers in order to avoid initiation of legal action,” said Kalita. DTO Kalita is now eyeing the e-rickshaw operators plying without registration numbers. “We are facing some sort of difficulty in registering the Chinese manufactured e-rickshaws. They do not have chassis or engine numbers. We are working out as to how to bring these unregistered e-rickshaws under the ambit of law,” said Kalita, adding that once registration is done it will bring in additional revenue for the Government. The DTO is hopeful that the authorities concerned will extend all help and support as he goes about in his task to bring the unregistered e-rickshaws under the purview of law. ” I am optimistic of finding a way out presently plaguing the present system that makes it difficult to bring the Chinese made e-rickshaws under the motor vehicle rules,” said Kalita who is due to hang up his boots this year.